Like I don’t have enough to deal with right now, my wife has me on some sort of juicing diet. She saw this documentary on Netflix about an overweight Aussie with an autoimmune disease who walked 3000 miles while limiting his diet to juiced fruits and vegetables. Of course, by movie’s end, he had shed 72 pounds and was finally cured of his life-threatening illness. His feet were a little sore, though. The movie won Best Documentary Feature at a film festival somewhere in Iowa. Still, the remarkable story squeezed new life from the juicing craze with the “Reboot Your Life” program—a “journey into wellness” in which one consumes only liquefied plant matter. Nom, nom. The testimonials are impressive: A housewife in Kankakee, Illinois lost 102 lbs, and her acne cleared-up. A man in Toledo, Ohio disappeared altogether. And since my blood pressure has been a little elevated lately, my well-meaning spouse decided that I too might benefit from such a regimen. 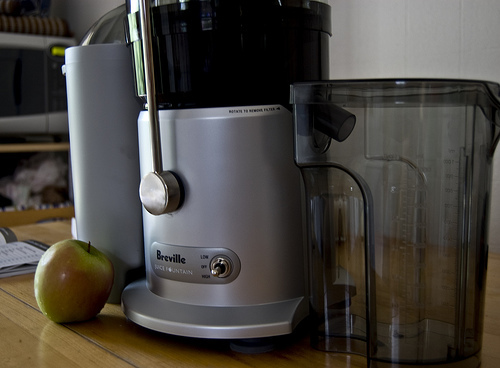 So she purchased a Breville, the “Mercedes Benz” of juicing machines. (I think an actual Mercedes would have been cheaper.) This precision-engineered, surgical steel contraption has spinning blades so razor-sharp it could slice off Rube Goldberg's ring finger just as easily as frappe an entire beet. Beta vulgaris, from the Chenopodiaceae family of plants, the same root that starving Muscovites use to make Borscht, a cold soup that can make me vomit on sight. But toss in a few pears, some crisp Fuji apples, celery stalks and a carrot or two and—voila—you have a healthy elixir that is equal parts nutritious and delicious! Really, the only interesting thing about this juice diet is how to cheat it. But since the pantry has been purged of all foods that either A.) might contribute to my slight hypertension, or B.) have any flavor whatsoever, a reckless binge here might consist of unsalted almond butter on sprouted grain bread. …Or floor wax, which I’ve noticed tastes a little better that the sodium-free almond butter. So tonight as I write this, I’m enjoying a cool, isopropyl alcohol-and-lemon spritzer on the rocks, and a wheatgrass smoothie. With a straw. My blood pressure be damned. *sigh* I so need to do that. Be glad you have a Julie in your life. I'm not Julie (not to be confused with "I'm not Lisa.. my name is Julie"...). I NEED a Julie. Instead, I have a Chuck and an Adam, and they both love red meat and mashed potatoes. Do you think you could spare her for just a few weeks? Her and her Mercedes... ? Pretty please...? Oh boy, sounds like I won't be inviting myself to dinner anytime soon. Good luck! If I thought it would help, I would say I feel your pain . . . but I'm not a good fibber, so you're on your own with this one. As Foursons said, good luck! Oh, btw, I heard that kale is an amazing superfood. Try adding that to your beet/pear/apple/celery/carrot mix, and you'll be on the road to perfect health in no time flat. Squeeze a little melted floor wax on top and it would be positively sinful (just make sure it's cholesterol-free floor wax :-).